MIG Insurance is a forward-thinking Western Canadian insurance broker. Since opening in1995 they have grown to nine locations, servicing clients in cities and communities throughout Southern Manitoba. MIG is facing new competitive pressures from insurance companies who sell coverage directly to customers through online channels, in addition to web aggregators which capture leads in bulk. These shifts in purchasing dynamics have begun to pose a competitive threat to insurance brokers like MIG. 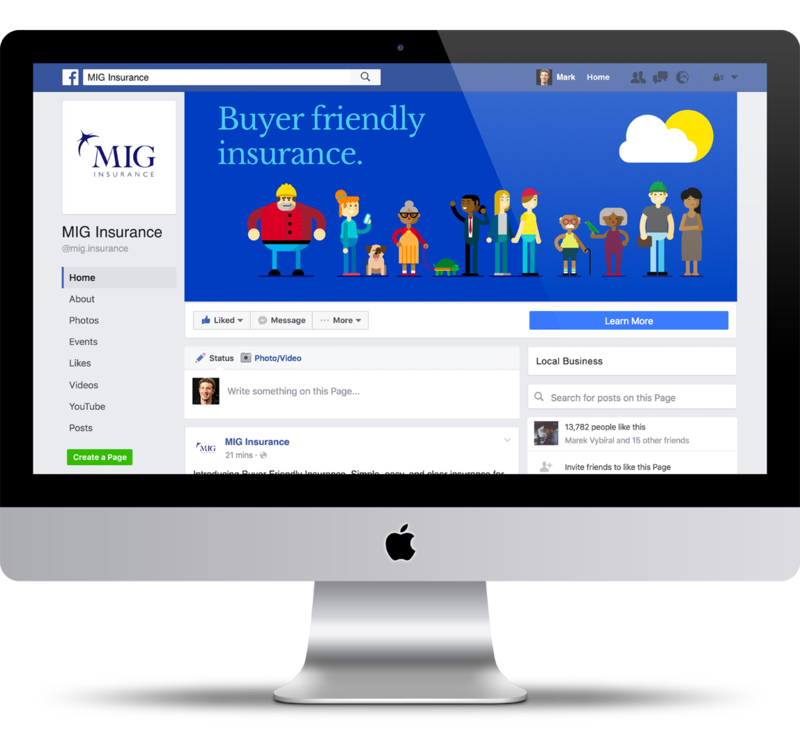 We were initially approached to review and revitalize MIG’s marketing focus, and to implement a new “Buy Online” insurance offering. After our initial consultations, it became clear that MIG needed to redefine its market position in order to remain relevant. It was concluded that MIG was not ready to effectively compete online. In order to make a significant impact, MIG would need to be perceived as a digital native — matching the user experience level that customers have come to expect from the best digital retailers. To understand how MIG could better meet market demand, we undertook an audit and analysis of their industry, competitors, and target audiences. It became clear that the insurance sector has been lagging in both technological and customer innovation. In addition, differentiation between brokerages is not clearly perceptible to audiences. Of deeper concern were the results of a Capgemini study, stating that customer satisfaction has hit worrying lows. Only 29% of customers globally stated that they were satisfied with the services of their insurance provider. To respond to changing customer expectations, we realized that it was important for MIG to take a leadership role in innovating the customer experience. While brokers like MIG don't have the ability to change the process or requirements needed to obtain insurance, it was agreed that there was significant room to improve on the overall customer experience. To accomplish this, it was necessary to redefine and re-contextualize the role of MIG as more than an impartial middleman. They needed to meet customers’ high expectations for service by “retailizing” the insurance experience. As a broker, MIG was in a unique position to provide this. Their hands-on and attentive approach was superior to direct-sales insurers or online aggregators, both of which had limited interactions and experience dealing directly with people. The tailored customer experience was something MIG could leverage to their distinct advantage. The concept of ‘Buyer Friendly Insurance’ was developed to signal MIG’s shift away from a company that simply sells insurance, to one that empowers customers with the tools and knowledge to buy the insurance that’s right for them. It was important for MIG to remove the sales pressure, while remaining highly reactive to people’s needs where and when called upon. The core brand principles were rewritten to focus squarely on the customer. Each element was made more concise to make them memorable and easy to implement. This would set the direction of the rebrand. This clearly expressed the unique value that MIG Insurance would provide, in contrast with their competitors. To delight people with our customer centric approach to insurance. The brand essence was fused with the mission, to make this goal an indivisible part of MIG as a company. These easy-to-achieve brand traits are all that would be required for any representative of MIG to express the essence of the brand. Rather than abstract notions that are difficult to interpret, we distilled the values down to principles that require less guesswork to put into practice. MIG’s position in their market needed to be unequivocal. This brand position is a simple benchmark, requiring a limited amount of analysis to keep their brand on track. With this narrative, MIG constructs an immersive brand experience that invites their customers to imagine a world where customers are in control of how they get insured. Because of the inherent complexity of MIG’s business, it was important to create a messaging framework that structured the flow of information — making their communication clear, informative, and relevant. We developed a messaging hierarchy that flows from top-level positioning down through messaging pillars, where they are manifested into statements that support the core brand proposition. The result is a structured mechanism for rapidly aligning communication through a set of distinct themes, supporting the overall brand proposition down to the individual product level. 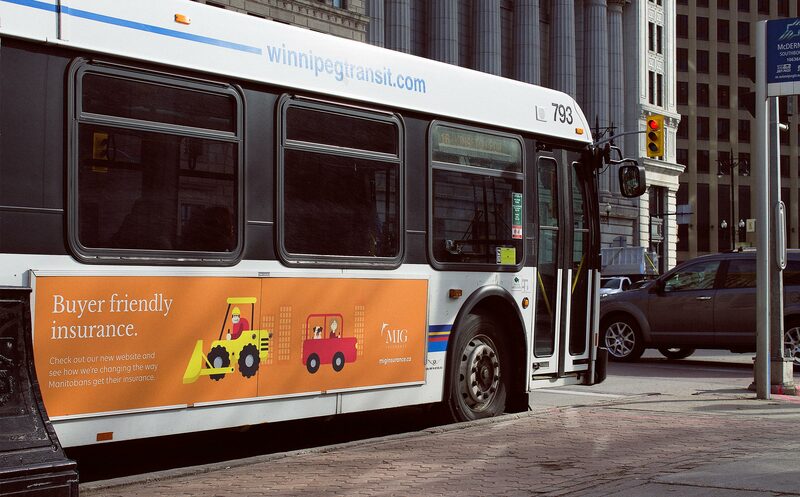 Identity had a large strategic role to play in establishing MIG’s new brand position. 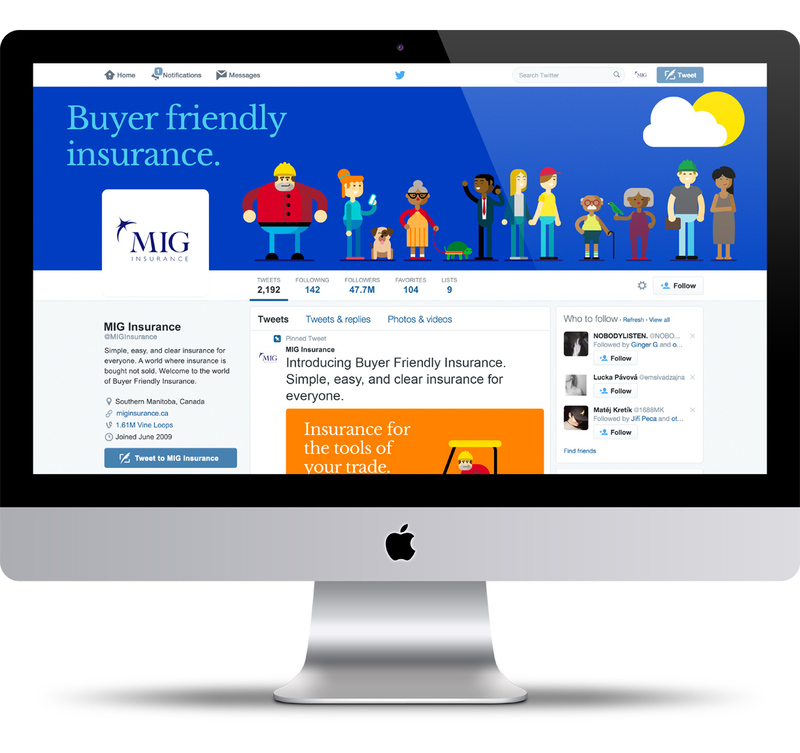 It needed to look ‘buyer friendly’, and to send a clear signal that MIG was unlike other insurance brokers. 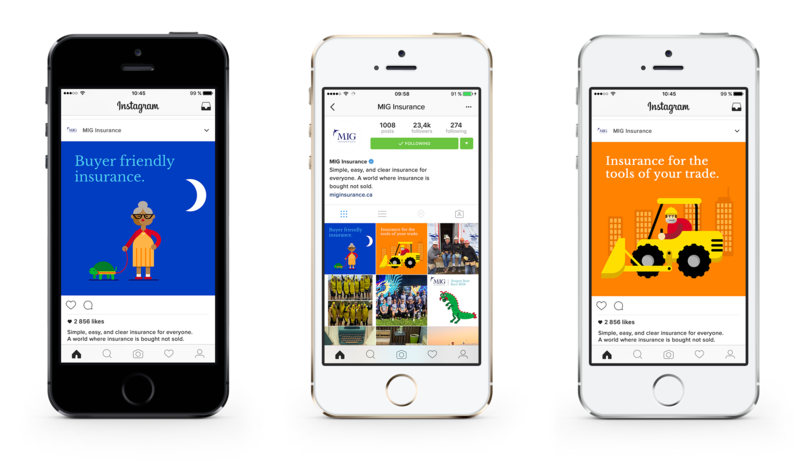 Having created a brand story for MIG that imagines “a world where insurance is bought, not sold”, we knew it was important to fully articulate that idea. MIG has always been a “blue” company and our aim was not to change this, but to make it more clean, friendly, and inviting. This was accomplished by expanding their range of blues to incorporate a medium blue (MIG Cobalt), and a light blue (MIG Sky Blue). In order to support MIG’s complete visual language, an extensive supplementary palette was developed, comprised of a colour wheel of 12 base colours with three tints and three shades each for a total supplementary collection of 84 colours. We gave the colours a numeric system where 400 represents the base colour, and 100 and 700 represent the lightest and darkest respectively. This is meant to aid in identification and classification. This palette was then extended further to include 13 skin tones and 14 cool and warm grays each. This gave us 125 unique colours to help bring MIG’s brand world to life. Each colour was derived from Pantone’s bridge series to ensure consistency across print and digital channels. Typography is central to accurately communicating brand character and value. It was important for our type choices to feel friendly and slightly playful, as well as be open and easy to read. We also wanted the type to pay respect to MIG’s origins, to provide some continuity from MIG’s previous identity. We chose Libre Baskerville and Volte. These typefaces expressed the essence of MIG’s commitment to a clear and simple user experience, and were in keeping with the positive aspects of MIG’s brand character. To keep branded communication consistent throughout all channels, a typography sizing ratio system was created. This included headline point size to leading size ratios, headline point size to post paragraph spacing ratios, headline to sub-headline point size ratios, and sub-headline point size to leading size ratios. To create a rich and immersive brand environment for MIG, we invented a distinct visual language from the ground up. To express simplicity through form, we started with a circle. From a simple circle we developed a core set of shapes that would allow us to create a rich visual language for the brand. With the basics of the visual language in place, it was possible to begin articulating MIG’s brand identity by creating a set of proprietary icons. These would allow us to create quick visual identification for MIG’s range of products. 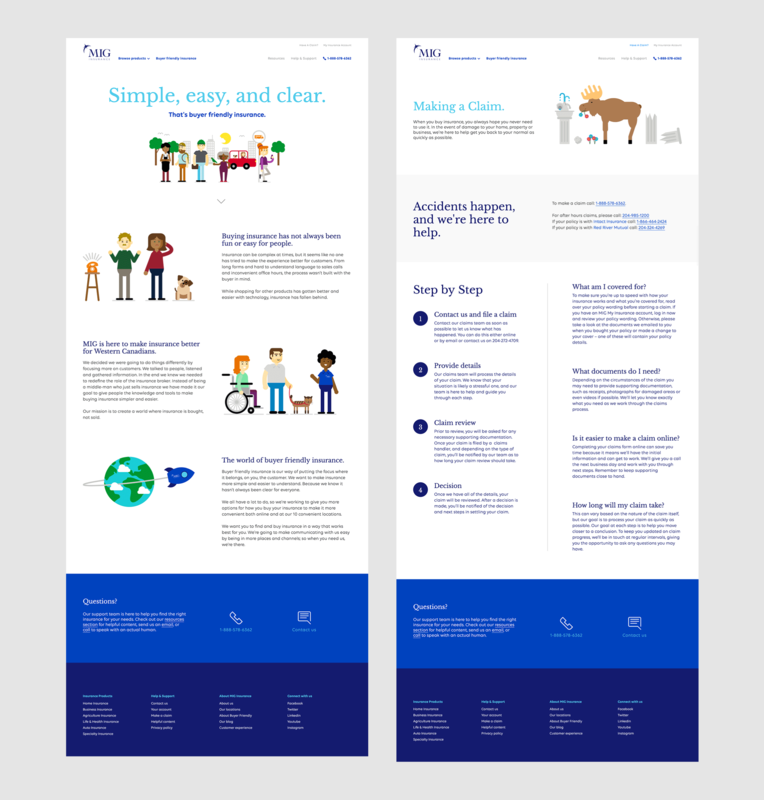 To provide a seamless brand environment, we used our visual language and a rich illustration style to create ‘a world where insurance is bought, not sold’. MIG is now able to demonstrate in clear, simple, and branded terms their diverse product offering, and the nuanced scenarios in which they are relevant to their customers. 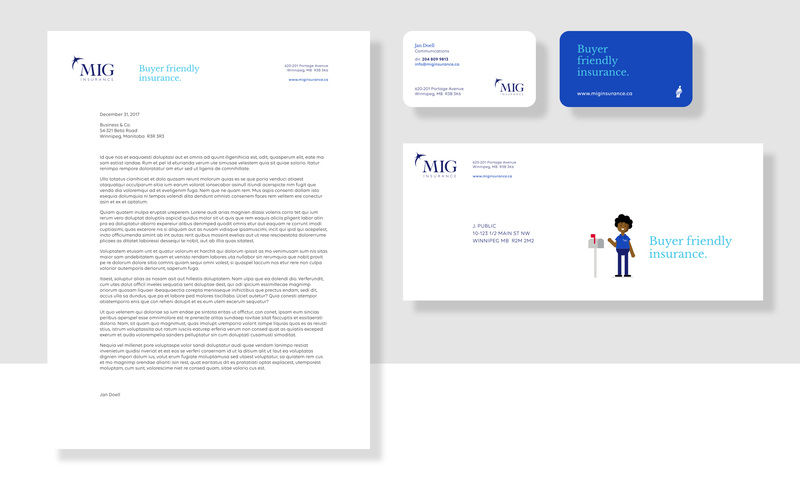 The result of our identity work has enabled MIG to express a far richer brand experience than any of their near competitors. It also allows them to be highly reactive in their communication, through the rapid development of key branded marketing pieces that can communicate highly complex concepts. Where competitors may need to rely on generic stock imagery or expensive and time-consuming photo shoots, the illustrated language saves time and resources. MIG can take an original concept to a finished, market ready, branded communication piece in a matter of hours. Once the strategic phase of our work was complete, we began building the core assets that would bring the new MIG brand to life. MIG’s web presence needed to be a full articulation of the work we had recently completed. The website would be the platform that would allow customers to take control of their insurance-buying experience. 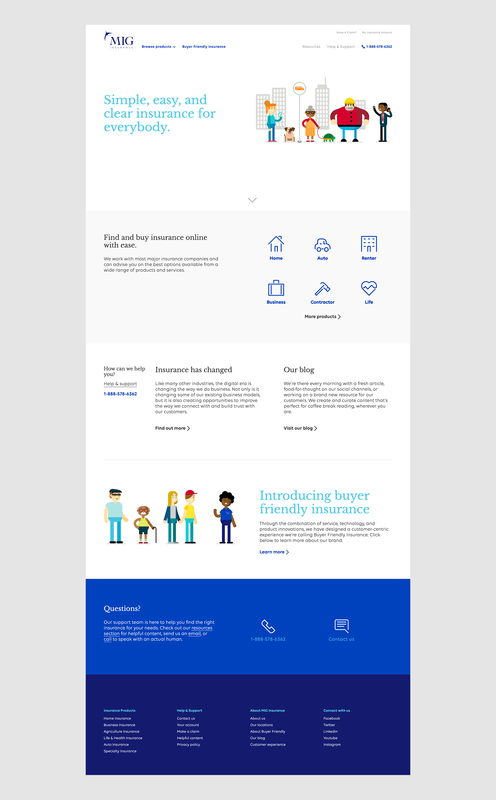 Every aspect of the new website had to be ‘Buyer Friendly’. With the new brand tools in place, we coordinated all of MIG’s social channels to deliver a seamless brand experience across all properties. All brand properties and touch-points needed to be considered within the rebrand. After cataloging the individual materials that would be required, a production strategy and schedule that worked with existing budget allocations was mapped out. From the start of the project, it was clear that preserving MIG’s investment in their brand would be critical to long-term success. Having the tools to communicate the strategic messaging, and to put branded materials directly into the hands of brokers across multiple locations, would be the key to successful deployment. 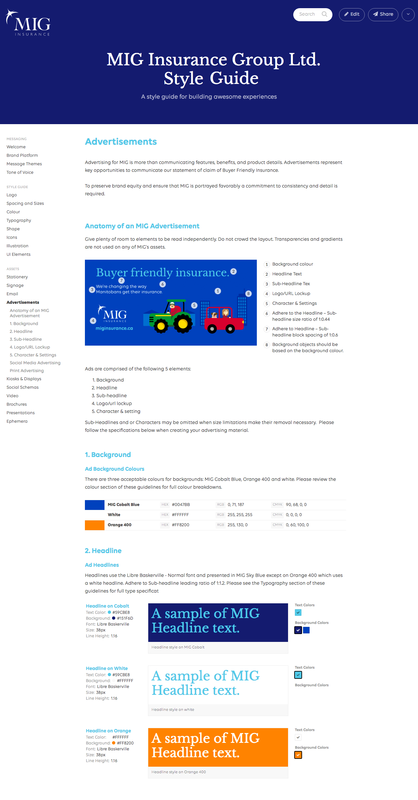 A digital brand style guide and asset hub was developed, which would allow MIG to centralize their communication materials and assets. Once the key assets were in place, it was time to take MIG to market with their new brand and strategy. A multi-phase campaign strategy was developed, focusing on several distinct stages of the customer journey. The first phase focused on broad-based awareness, introducing audiences to the new brand and the ‘Buyer Friendly Insurance’ concept. Awareness for the brand was built by rolling out a suite of outdoor and social media advertisements. Phase two built familiarity by diving deeper into MIG’s core messaging pillars of accessible, simple, and helpful online insurance. Once familiarity of MIG and their new brand proposition had been established, longer cycles of consideration were implemented, focusing attention towards the individual products MIG offers. Within three months of working with MIG to launch Buyer Friendly Insurance, significant growth was measured across traditional and digital channels. Client provided feedback that inbound leads and information requests were higher qualified and of better quality.